Google Boost vs Adwords: Which One Fits Your Business Needs? You are here: Home / Local SEO / Google Boost vs Google Adwords: Which One Fits Your Business Needs? Google Boost vs Google Adwords: Which One Fits Your Business Needs? Google Boost vs Google Adwords – Which One Fits Your Business? If you are a small business owner looking to get more traffic to your website, you have probably thought about using Google’s paid options: Google Adwords and Google Boost. While most business owners have heard about the Adwords program, and have a very decent idea of what it is about, but the Boost Program was released only a couple of years ago, so it is still fairly new to most. Which advertising program is more beneficial to small business owners: Adwords or Boost? In order to illustrate the differences between them, we first need to know…. That little marker you sometimes see in a Map, in Google searches. Geared towards local search. Searches which trigger local places listings and map listings (Geo-targeted Searches). Tied to your Google Places listing. It will use your listing information to determine location and other contact info. Line Two is Google’s generated description extracted from info in your Google Local Listing. Display url can be your website or your Google Places URL. Displayed in Google Search and Google Maps. Again for geo-targeted searches. Easy to setup. Just provide a monthly budget and other ad info and you are ready to roll. A Category-Based way to advertise. You select a category you want to appear for, Google determines the keywords that are going to trigger your ad. Available for US advertisers only. Although it is planned to be available in the rest of the World, as of right now it is only available for advertisers with Google Places listings with an US location. Limited to the areas your Google Places listing qualifies you for. 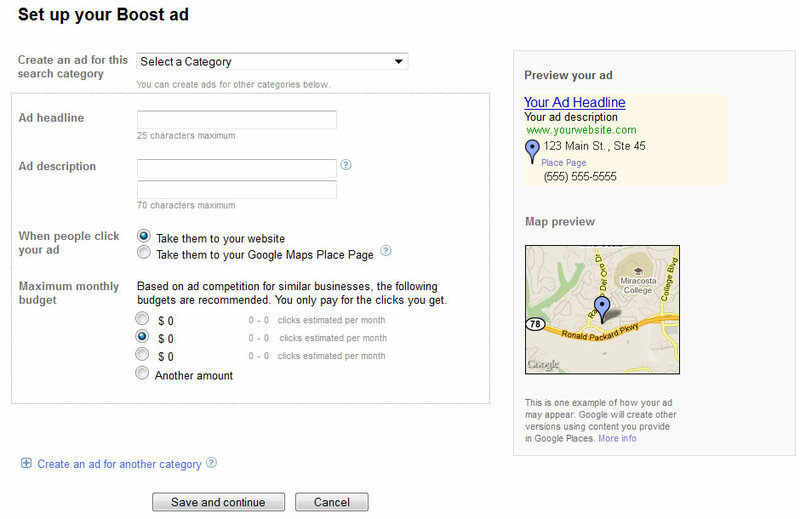 Your ad will ONLY show up in the areas surrounding your address in Google Places listing, determined by Google. Comes with a FREE Google Voice number. Used for your Google Boost ad only. NOT cheap. with ease comes pay. 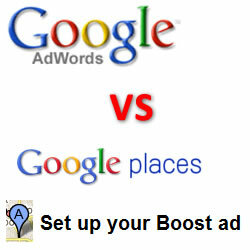 a Google Boost Category bid will cost you up to 3 times per click, compared to a Geo-targeted Google Adwords campaign. How does Google Adwords compare to Google Boost? Locations: You can setup campaigns in places outside your Google Places Listing area. Result: More reach for your business. Days and Times: Your campaigns can run only during business days and hours, if you choose it that way. Keyword bidding: You can choose to bid or not in certain keywords, increase bids for some and lower it for other ones. Multiple Ads: You can have different Ad Copy for different Ad Groups. Adwords Provides Advanced Reporting. You can know which keywords / ads / areas / bids / landing pages are working or not. Cheaper Cost Per Clicks (CPC). Again you are in control, should you decide your campaign is not working or not, you can just change your CPCs and the changes will be live within 15minutes. Just How Much Difference there is in Cost, Between Adwords and Boost? Should You Do Google Boost or Google Adwords? Simple Setup, Simple Reporting, Restricted Campaign Options, Low Control, High Cost. Medium to Advanced Setup, Advanced Reporting, Enhanced Campaign Options, High Control, Low – Medium – High Cost. What if I don’t know anything about Adwords? In my opinion, you can get better results by using Google Adwords for advertising, and having a consultant managing your PPC Campaign. The cost can be the same or less, and there is the sense of control that every business owner longs for. Most PPC Management companies have very high minimums, and some won’t even take small budget accounts, but we do. We could manage your account on a monthly basis, or one time or periodic campagin optimizations, whatever fits your needs. What Is A Paid Link and Do They Still Work? How To Make a Membership Website in Less Than 1 Day? For the last 6 years, Rosana Levesque has dedicated herself to help local and global businesses to succeed online: optimizing their website design, analytics, conversion and follow up. In the business heart of Carlsbad, our little office sits on the first floor of a .
We’d love to hear about your upcoming project. Tell us all about it by filling out our contact form. Want to keep up with what’s going on at the agency? Follow us across our Social Networks.